The 3GP and 3G2 video file formats are specifically designed to play on mobile phones. Third Generation Mobile Phone (3GP) format produces small files with extension .3GP. These files are created and played on third generation mobile phones using GSM. For CDMA phones, use the 3G2 format. The compression of videos is quite high so that it can play back with acceptable quality on a small screen, using the low-powered processors of cellular phones. They can be played on a PC using Apple's QuickTime Player. Click Formats >> Select Standard Formats >> 3GP >> Configure. The Intel(R) H.264 (AVC) requires less bandwidth. Thus the media files can be played easily on your mobile phones. You can change the compressor from the drop-down menu. The frame rate is set to 15 Fps, and bitrate is 512 Kbps. You can choose to retain or change the dimensions of the video. 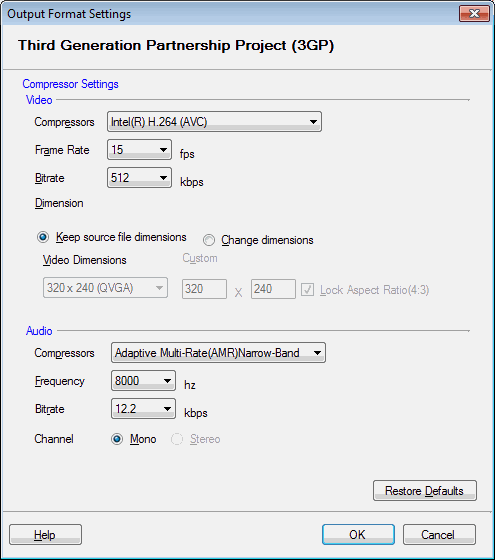 The Adaptive Multi-Rate (AMR) Narrow-Band is adopted as the standard speech codec for 3GP format. It provides better quality and more cell coverage. AAC is only supported by some newer devices. The quality of sound is much better when using this compressor - however you should check if you device supports it. The frequency is set to 8000 Hz and bitrate to 12.2 Kbps. Mono audio channel produces small files but the audio is heard at a constant sound level. 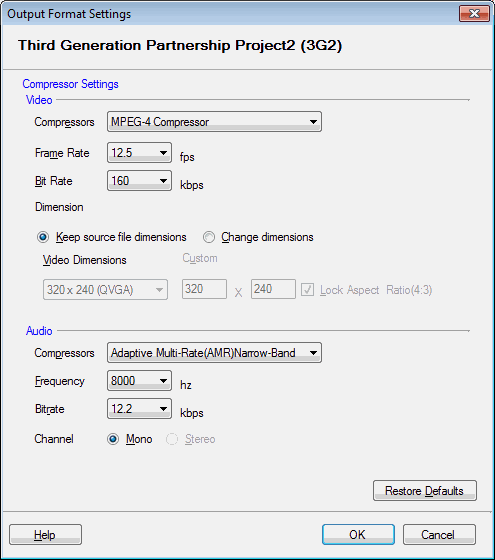 The MPEG-4 compressors are great for streaming media and CD distribution. The frame rate is set to 12.5 Fps, and bitrate is 160 Kbps. You can choose to retain or change the dimensions of the video. Adaptive Multi-Rate (AMR) Narrow-Band is used for mobile phones. The frequency is set to 8000 Hz and bitrate to 12.2 Kbps. Mono audio channel produces small files but the audio is heard at a constant sound level.